Conor Oberst + Ben Kweller = EPIC LOVE. This is going to be a brief music news update from me, but this is a HUGE reason why I love Austin: amazingly cool people live here. In 2006 at an Austin City Limits Festival pre-show at Stubb’s (Gnarls Barkley, to be exact,) I saw both Jake Gyllenhaal and Lance Armstrong hangin’ out on the upper deck. But tonight’s show at Stubb’s takes the cake. The AMAZING Conor Oberst graced us with his genius this evening (check him out, people!! Both the new stuff and the older stuff.) He is a ridiculously talented guitarist, a moving lyricist, and his band clearly has fun when they play together. They did a ton of stuff off of the new album, including “Moab” (their opener,) “Cape Canaveral,” “Sausalito,” “Get-Well-Cards,” “Lenders In The Temple,” the short-burst-of-energy-inducing “NYC – Gone, Gone,” the single “Souled Out!! !,” and they ended with “I Don’t Want To Die (In The Hospital)”. My favorite was a sweet love song that Conor said was a “love song from the future,” but I asked a super-fan what the song was, and she doesn’t think it’s ever been released. Now. All of this would be great just by itself. BUT, towards the end of the show, people started pointing to the left side of the stage. Turns out, Ben Kweller was hanging out (and it was so much fun to watch him dance around and really enjoy Oberst.) Then, the greatest thing ever happened: Conor coaxed Ben out on stage, and Ben played with the band on their last two songs (including “I Don’t Want To Die,” when many members of the 2 opening bands came onstage and it was just this giant party for everyone.) I tried to take pictorial evidence of all of this, but unfortunately, Stubb’s doesn’t allow flash photography, so everything came out really blurry. 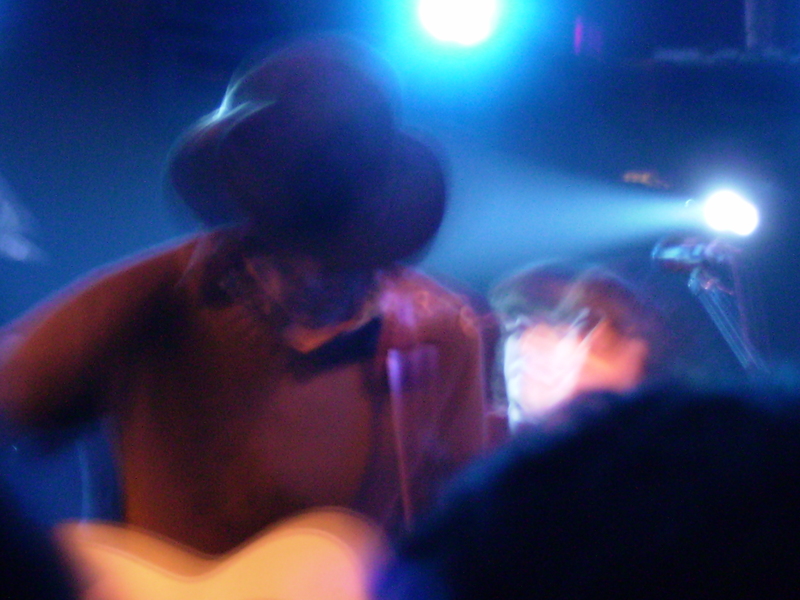 Still, I think the blurryness captures the energy, so I’ll share a couple favorites. 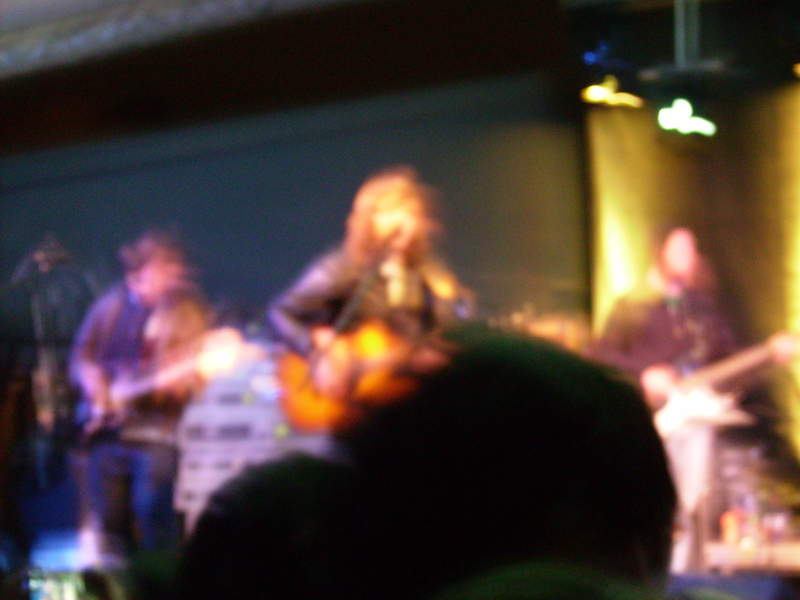 The blur in the middle is Ben Kweller! A fuzzy photo of sir Oberst. Thank you, Austin, for nights like this! Caitlin, I love your passion for music and your amazing ability to capture the greatness in words. I’m so glad that people enjoy my music craziness:) It’s such an obsession, I can’t help myself! Thanks for you kind words, Brittany! Me too, although Conor Oberst gives me indigestion.